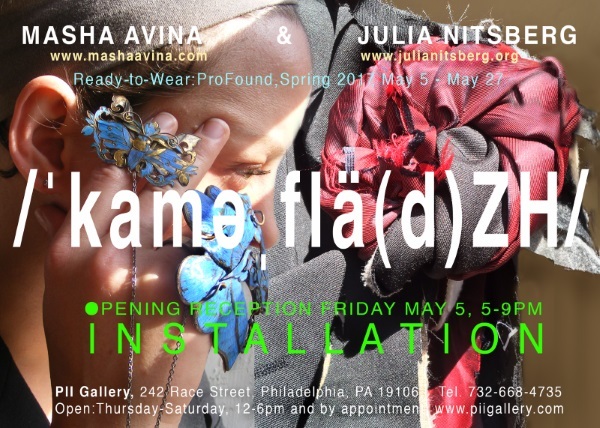 Philadelphia International Institute is pleased to announce: /ˈkaməˌflä(d)ZH/ - a new interactive installation, presented as a fashion show of ProFound Spring 2017, that opens Friday, May 5th, at 5pm, and will be followed by the artists’ reception 6-9pm. The exhibition and sale will continue through Saturday, May 26. The opening party starts with a runway performance - a procession of models will march down a golden catwalk to the soundtrack of military marches, cadences and chants. The upcoming multimedia installation is the first collaboration of Julia Nitsberg and Masha Avina, two New York artists, who share love for found objects and welcome accidents into their intuitive approaches. In their work both frequently cross boundaries between art and design, or art and world of fashion. For their ‘art-to-wear’ collections Nitsberg & Avina used a combination of found objects, unique or mass-produced, and transformed them into clothes and jewelry, either by construction or de-construction, using collage or direct manipulation. The idea of camouflage as a way to disguise something and to make believe or pretend it to be something else has been often exploited in art and it is not new to fashion. Dubbed /ˈkaməˌflä(d)ZH/, the collection has overtly literary, historical, social, political and sexual references. Eclectic by nature, the collection mixes reconstructed but elegantly crafted jackets, parts of military uniforms, playful underwear, avant-garde Laser cut jewelry, printed t-shirts, intricate headpieces, necklaces and rings, which will be displayed and offered for sale during or at the end of the exhibition. The installation verges on the edge of performance, thus the best way to experience it is watching it live. Do not miss the opening on May 5th! "Merry, Merry... Quite Contrary!" - a mixed media sculptural installation is specifically designed for PII gallery located in the Old City of Philadelphia, the birthplace of the nation. It is significant that the exhibition will take place in December, a month of traditional holidays and reflections on the past yearly accomplishments; and this year in particular - on the aftermath of presidential election. 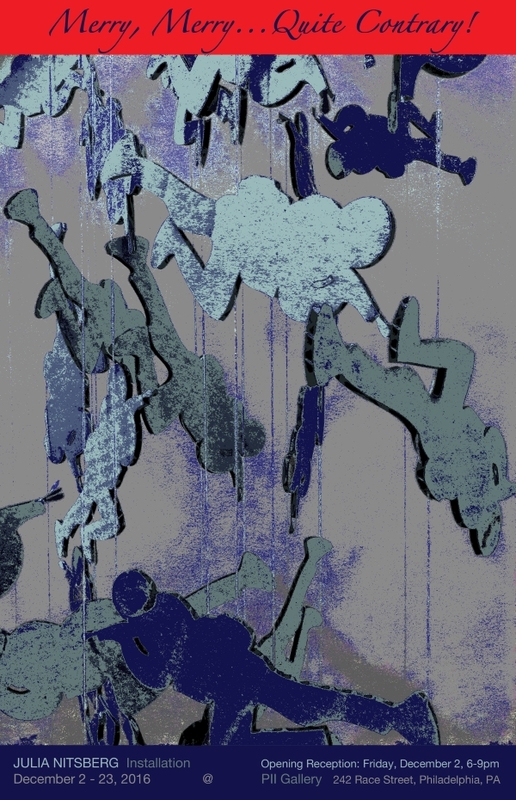 The installation is both visual and social commentary on the world shaken by disasters and political instabilities generated by a twofold phenomenon: accumulation of wealth and political control by a corporate few and the escalation of destruction and distress due to the spreading of armed conflicts around the globe. In times of decreasing religious sentiment let us return to the traditional values. On the day of the opening the public is invited to gather around a symbolic tree it and celebrate life in anticipation of the holidays by taking part in creating and manipulating the cutout ornaments and later helping the artist to decorate the tree. Installation: Merry, Merry, Quite Contrary!